You will be dropped back in Kensington and Victoria areas subject to traffic conditions. This exciting low-cost tour will take you from central London to Oxford, Stratford-upon-Avon, the Cotswolds and Warwick Castle for a day out that doesn’t pull any punches! Experience the glorious British countryside as your expert guide takes you from one destination to the next. Entrances are not included in the price of the tour but you can purchase them on the day. Known for being home to the oldest university in the English speaking world, Oxford is an enchanting maze of cobbled streets interspersed with historic squares. 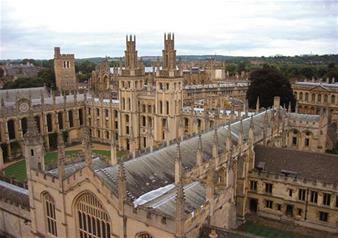 You will enjoy a guided walking tour of Oxford to see some magnificent architecture and renowned buildings. A highlight of the tour is the Bodleian Library, the main research library of the University of Oxford. It’s one of the oldest libraries in Europe and is the second largest in Britain! Arriving in William Shakespeare’s hometown of Stratford-upon-Avon, you will be able to see the half-timbered house where the brilliant playwright was born! The legendary Bard will be brought to life as you take a step back through history in this charming town – feel free to explore it at your leisure! Delve into the fascinating medieval period at Warwick Castle on your tour. This incredible fortress dates back to 1068 and offers visitors an interactive look into the hundreds of years of history that took place at the Castle. You can feel the weight of a sword and become a knight or see the State Dining Room decked out for a Victorian dinner party during a visit to Warwick Castle! Entrance fees are not included, but can be purchased on the day. *During busy periods, alternative transportation without Wi-Fi may be used. Brasenose College will be closed for tours from 30 November 2018 until 13 January 2019.